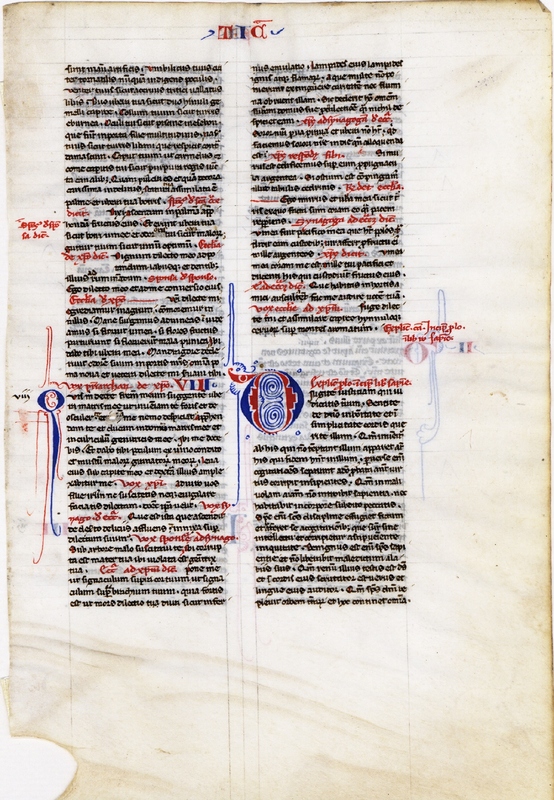 Text: Song of Songs 7:1-Wisdom 1:7 (recto); Wisdom 1:7-3:4 (verso). 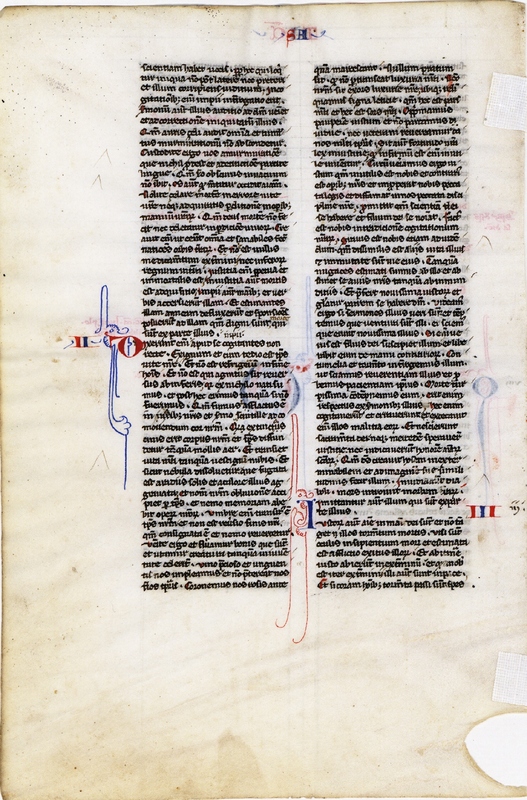 Note that space has been left for a short prologue to Wisdom in the B column of the recto, but no text appears. Reconstruction Note! In Ege's original manuscript, this leaf was followed by what is now Leaf 11 in the Cincinnati Public Library portfolio. -nus æmulátio: lámpades ejus lámpades ignis atque flammárum. Aquæ multæ non potuérunt extínguere caritátem, nec flúmina óbruent illam. Si déderit homo omnem substántiam domus suæ pro dilectióne, quasi nihil despíciet eam. Chórus Fratrum. Sóror nostra parva, et úbera non habet; quid faciémus soróri nostræ in die quando alloquénda est? Si murus est, ædificémus super eum propugnácula argéntea; si óstium est, compingámus illud tábulis cédrinis. Sponsa. Ego murus, et úbera mea sicut turris, ex quo facta sum coram eo, quasi pacem repériens. Chórus Fratrum. Vínea fuit pacífico in ea quæ habet pópulos: trádidit eam custódibus; vir affert pro fructu ejus mille argénteos. Sponsa. Vínea mea coram me est. Mille tui pacífici, et ducénti his qui custódiunt fructus ejus. Sponsus. quæ hábitas in hortis, amíci auscúltant; fac me audíre vocem tuam. Sponsa. Fuge, dilécte mi, et assimiláre cápreæ, hinnulóque cervórum super montes arómatum. Explicit canticum. Incipit prologus liber [ ] sapientia. Explicit prologus et incipit liber sapientia. ...that are made by the hand of a skilful workman. 2 Thy navel is like a round bowl never wanting cups. Thy belly is like a heap of wheat, set about with lilies. 3 Thy two breasts are like two young roes that are twins. 4 Thy neck as a tower of ivory. Thy eyes like the fishpools in Hesebon, which are in the gate of the daughter of the multitude. Thy nose is as the tower of Libanus, that looketh toward Damascus. 5 Thy head is like Carmel: and the hairs of thy head as the purple of the king bound in the channels. 6 How beautiful art thou, and how comely, my dearest, in delights! 7 Thy stature is like to a palm tree, and thy breasts to clusters of grapes. 8 I said: I will go up into the palm tree, and will take hold of the fruit thereof: and thy breasts shall be as the clusters of the vine: and the odour of thy mouth like apples. 9 Thy throat like the best wine, worthy for my beloved to drink, and for his lips and his teeth to ruminate. 10 I to my beloved, and his turning is towards me. 11 Come, my beloved, let us go forth into the field, let us abide in the villages. 12 Let us get up early to the vineyards, let us see if the vineyard flourish, if the flowers be ready to bring forth fruits, if the pomegranates flourish: there will I give thee my breasts. 13 The mandrakes give a smell. In our gates are all fruits: the new and the old, my beloved, I have kept for thee. 1 Who shall give thee to me for my brother, sucking the breasts of my mother, that I may find thee without, and kiss thee, and now no man may despise me? 2 I will take hold of thee, and bring thee into my mother's house: there thou shalt teach me, and I will give thee a cup of spiced wine and new wine of my pomegranates. 3 His left hand under my head, and his right hand shall embrace me. 4 I adjure you, O daughters of Jerusalem, that you stir not up, nor awake my love till she please. 5 Who is this that cometh up from the desert, flowing with delights, leaning upon her beloved? Under the apple tree I raised thee up: there thy mother was corrupted, there she was defloured that bore thee. 6 Put me as a seal upon thy heart, as a seal upon thy arm, for love is strong as death, jealousy as hard as hell, the lamps thereof are fire and flames. 7 Many waters cannot quench charity, neither can the floods drown it: if a man should give all the substance of his house for love, he shall despise it as nothing. 8 Our sister is little, and hath no breasts. What shall we do to our sister in the day when she is to be spoken to? 9 If she be a wall: let us build upon it bulwarks of silver: if she be a door, let us join it together with boards or cedar. 10 I am a wall: and my breasts are as a tower since I am become in his presence as one finding peace. 11 The peaceable had a vineyard, in that which hath people: he let out the same to keepers, every man bringeth for the fruit thereof a thousand pieces of silver. 12 My vineyard is before me. A thousand are for thee, the peaceable, and two hundred for them that keep the fruit thereof. 13 Thou that dwellest in the gardens, the friends hearken: make me hear thy voice. 14 Flee away, O my beloved, and be like to the roe, and to the young hart upon the mountains of aromatical spices. Here ends the Song. Here begins the prologue to Wisdom. Here ends the prologue and here begins the book of Wisdom. ...hath knowledge of the voice. 8 Therefore he that speaketh unjust things cannot be hid, neither shall the chastising judgment pass him by. 9 For inquisition shall be made into the thoughts of the ungodly: and the hearing of his words shall come to God, to the chastising of his iniquities. 10 For the ear of jealousy heareth all things, and the tumult of murmuring shall not be hid. 11 Keep yourselves therefore from murmuring, which profiteth nothing, and refrain your tongue from detraction, for an obscure speech shall not go for nought: and the mouth that belieth, killeth the soul. 12 Seek not death in the error of your life, neither procure ye destruction by the works of your hands. 13 For God made not death, neither hath he pleasure in the destruction of the living. 14 For he created all things that they might be: and he made the nations of the earth for health: and there is no poison of destruction in them, nor kingdom of hell upon the earth. 15 For justice is perpetual and immortal. 16 But the wicked with works and words have called it to them: and esteeming it a friend have fallen away, and have made a covenant with it: because they are worthy to be of the part thereof. 1 For they have said, reasoning with themselves, but not right: The time of our life is short and tedious, and in the end of a man there is no remedy, and no man hath been known to have returned from hell: 2 For we are born of nothing, and after this we shall be as if we had not been: for the breath in our nostrils is smoke: and speech a spark to move our heart, 3 Which being put out, our body shall be ashes, and our spirit shall be poured abroad as soft air, and our life shall pass away as the trace of a cloud, and shall be dispersed as a mist, which is driven away by the beams of the sun, and overpowered with the heat thereof: 4 And our name in time shall be forgotten, and no man shall have any remembrance of our works. 5 For our time is as the passing of a shadow, and there is no going back of our end: for it is fast sealed, and no man returneth. 6 Come therefore, and let us enjoy the good things that are present, and let us speedily use the creatures as in youth. 7 Let us fill ourselves with costly wine, and ointments: and let not the flower of the time pass by us. 8 Let us crown ourselves with roses, before they be withered: let no meadow escape our riot. 9 Let none of us go without his part in luxury: let us everywhere leave tokens of joy: for this is our portion, and this our lot. 10 Let us oppress the poor just man, and not spare the widow, nor honour the ancient grey hairs of the aged. 11 But let our strength be the law of justice: for that which is feeble, is found to be nothing worth. 12 Let us therefore lie in wait for the just, because he is not for our turn, and he is contrary to our doings, and upbraideth us with transgressions of the law, and divulgeth against us the sins of our way of life. 13 He boasteth that he hath the knowledge of God, and calleth himself the son of God. 14 He is become a censurer of our thoughts. 15 He is grievous unto us, even to behold: for his life is not like other men's, and his ways are very different. 16 We are esteemed by him as triflers, and he abstaineth from our ways as from filthiness, and he preferreth the latter end of the just, and glorieth that he hath God for his father. 17 Let us see then if his words be true, and let us prove what shall happen to him, and we shall know what his end shall be. 18 For if he be the true son of God, he will defend him, and will deliver him from the hands of his enemies. 19 Let us examine him by outrages and tortures, that we may know his meekness and try his patience. 20 Let us condemn him to a most shameful death: for there shall be respect had unto him by his words. 21 These things they thought, and were deceived: for their own malice blinded them. 22 And they knew not the secrets of God, nor hoped for the wages of justice, nor esteemed the honour of holy souls. 23 For God created man incorruptible, and to the image of his own likeness he made him. 24 But by the envy of the devil, death came into the world: 25 And they follow him that are of his side.